It's a Small World After All, it's a small....small....world....for a Cat! We have been wanting to write about what was going on with Bear, but due to my mom's worry about the safety of Bear, we have not been able to. We think it is time, and we ask all the DWB'ers and all our kitty and hammie friends to please pray for Bear. We can't go into detail, for the sake of Bear's safety, but my ex-step-daddy has stooped to whole new low. We ask that you help us pray that Bear will be surrendered to my mom. Here are the last pictures mom has of spending time with Bear on Sunday 6/7. Mom took him to play with some new doggie friends, and mom had never seen him so happy. Bear was running and frolicking for hours. Bear could not believe his good fortune to meet these new pals. Mom then took him to Petsmart and let him pick out some new toys and treats, and then took him for a walk in our neighborhood. He was so pooped out after the wonderful day he had, but oh so happy. Then mom had to take him back to my ex-step daddy. Bear said: "No, mom, please don't leave me here. Pleeease take me with you!" But mom thought she did the right thing in order to not enrage my ex-step-daddy more, so she left Bear there. This was the last time mom saw Bear. Bear was supposed to be surrendered to mom after this. This did not happen, and my ex-step-daddy relocated Bear. Bear was gone. Mom searched and searched for Bear on all the rescue sites, and petfinder.com. Finally she learned where he was on 6/21. To hurt Bear, to hurt my mom is just despicable. We can not explain details now, but we ask that everyone please pray for Bear, and his safe return to my mom. Before you go, please sign my GUESTBOOK, and stop by my BIG WORLD too, thanks! Bear we will pray for you, we love you. My mom is having an anxiety attack worrying about Bear. I hope your mom can get him back. Bear can come and live with us. We'll say many prayers for him and your mom. We will be thinking of him 24/7 ! Bear will be fine ! Bear ! We're waiting for you to return safe & soundly sweet baby boy !! Oh Bear, momma's eyes are leaking reading about you. We are sending all our thoughts your way that you can be rescued and returned home. We are purring and Praying for Bear! And for you and your Mom! Some people that you thought you loved, should not treat animals this way! We will be praying and keeping Bear in our thoughts! We hope Bear gets returned to you asap! This is the most destwessing..I am pwaying vewy hawd and so is Mommi.why awe some hoomans so mean and howwible???? Poww sweet Beaw hasn't huwt anyone and should be wif hi loving Mom.. If you are Bear's daddy and are reading this, please know that Bear has alot of friends who so dearly love and miss him. He is a good boy and seemed so happy playing with those other doggies. We pray for Bear because we are deeply heartbroken because we miss him. We also pray that there is goodness in your heart and you will give us our friend back. Bear has done nothing wrong, he is just a baby and doesn't know why things are the way they are. Please, I beg you with all my hearts, please let us have Bear back. I am not afraid to cry and my eyes leak today and for every day he is gone. oh no, we are so worried about Bear now. he is a good doggy and innocent. he doesn't understand about human peoples' disagreements. please be safe, Bear, we want you to come home to your mommy who loves you and will take care of you. we are sending all of our paw power, power of the Bs, and poodle power to keep Bear safe and to bring Bear home to his mom. we are very sad that humans have to hurt innocent pups in order to inflict pain on other humans. very sad. very worried. Oh no! We will definitely be POPing that Bear is returned to your mom very soon. Please keep us updated! I am saddened to learn about Bear. I am sending my very best purrs that he will be safely returned to your mom, and right away. Bear deserves to be happy and well-cared-for regardless of whatever is going on. I hope that your mom is able to get him back from wherever he is. w00fs, this is to JB's step dad...i no, u prolly read the bloggie and i ask u PLEASE, dont hurt BEAR!!!!! He is a innocent little dog, who loves both of u unconditionaly..He dont understand any of this..for his sake Let him go home to JB, Chester and his mom..
i know i should not do this but since it is solstice and my superdog powers is superbarky, i am keeping keeper's candles burning all night to bring bear home. look, i can even comment now! bring bear home to JB's world. We are praying for Bear here at Ao4 HQs. We are praying mighty hard! He obviously cares nothing for Bear nor for his family. I truly truly hope you get him back, and that you then whip this fella's behind with any law you can find that will do it. My God, what a cruel, dispicable thing to do. I just don't know how some people can live with themselves. Sending hugs and all my hopes. How despicable can one person be??? We are crossing our paws and sending sibe vibes for the safe return to you of Bear. JB, we are hoping for the best possible outcome from this situation and that it gets resolved soon. Oh no! Bear, JB, Chester, and Mom, we are so sad to hear that this has happened. We are howling to heaven for Bear to be returned safely and soon. I am sending all my brown dog vibes out to Bear to keep him strong until he gets to come home, and to you all too. We will pray for all of you. As so many have commented, Bear is an innocent who doesn't deserve to be caught up in the middle of something he doesn't even understand. It is not fair to punish him this way! This is terrible! We have been wondering about Bear but didn't want to ask as we knew it was too painful. We are so sorry about all of this. Jan is praying for his safe return to your mom!!!!! Oh No! We actually think of Bear often, and had been wondering what had happened to him. We will all join together in sending the mightiest good thoughts we can so that he is safe and sound, and back with those who love him. We want Bear back in our lives too! That's terrible! Hope Bear makes it safely home again SOON! What is wrong with some people????? ?....how could anyone want to hurt a poor innocent animal. We hope and pray Bear is ok. He belongs with his mum, someone who loves him. Poor Bear. We hope he comes to your mom soon. We are thinking of all of you. Oh that is just terrible. We sure hope that Mom gets Bear back really soon. Our prayers go out to her. We know how upset she is... Hang in there mom with all the DWB's praying for him he will be home soon..
Thats so shocking. I''ll pray for very very hard for Bears safe return JB. Look after your Mom she must be so distressed. Me and my Mom are sending some comforting big hugs to you all and I'm keeping paws crossed. Mommy eyes were leaking. I will snuggle for Bear & Mommy will pray nonstop for y'all & Bear! We loves y'all! We are purring for you that you get Bear safely back home with you. Keeping Bear in our prayers as well. You may want to try http://HolyLandPrayer.com. We submitted a prayer request for our mom who was very sick. The Church of the Holy Sepulcher is a very important place for all of us. The LORD is with us and you. God bless. We are praying for you and for Bear's safe and speedy return. The EX is a horrible person and someday will be punished. God bless you. Oh no, we are so sorry to hear this. We are praying really hard for sweet Bear - we love you Bear!! And we love you guys too - JB, Chester and Mom. Please let us know if there is anyhthing we can do. 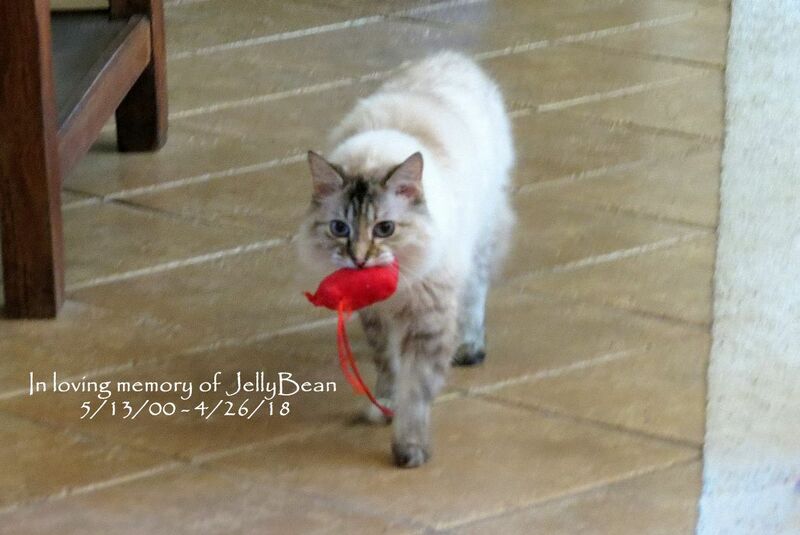 Our mom was just thinking about Bear the other day...wondering how he was doing...and now this...we are so sad...but we are purraying so very very hard that things will work out and Bear will find his way back to all of you! Mom read dis to our daddy and he sed dat was a "sick" thing to do. Our little fuzzy babies are not pawns to be used to punish and to be hurt in da process. Please send Bear home to his mom. Oh my God that is just horrible! We will be praying and praying that you get Bear back. I thinks your ex dadda needs to be scheduled! AND if what we are reading is correct, though we hope very much not, be put on the list of possible offenders. If this man has hurt Bear he needs to be locked up and medicated. This is so sad. Please know that all of us are purring and purraying for Bear's safe return! Oh noes!!!!! That is really too much!! Your ex-step daddy is sounding very vindictive. We would not want to go flying on his plane!!!!!!! We will purr very hard for Bear and for him to be OK!! We will also purr that ex-step daddy sees the error of his ways and starts acting human again. Oh JB and Chester and Mom we will purr for Bear's healthy return. Big Mom hugs to you too! I have my paws crossed and my mom is praying for Bear's safe return to your home! Hello again, JB. Sophie Kitty left a message for you, so we're just going to copy and paste it for her. "I've tried to leave a message for JB, but Internet Explorer keeps shutting down when I visit. Please let her and her fambly know I'm purring for Bear?" Me and Arrow are so sorry about Bear. We're crossing our paws and hoping he comes home. That's just terrible! All of our paws are crossed for him. Oh no, we are praying for Bear's safe return. This is terrible! I am purring and praying for Bear's return and for all of you, especially your mommy. We are purring & purraying for Bear to be returned safely to your mom. Oh no! My mom and I are so saddened to hear how the ex is using poor Bear to get back at your mom. I am sending special purrs and mom is sending purrayers that Bear will be back with all of you very soon!!! I'm disgusted by your ex's behavior! That is frightful and horrible! If there is anything I can do!!! We will prayer and purr that bear is returned to you ASAP!!!! I came back to see if thewe's any news about sweet Beaw. I am sorry for Bear but I will hope and hope that Bear comes home soon. Oh poor Bear! I hope your mum can get him back quick smart! I will purr as hard as I can for him. We're sorry to hear this. Hope Bear comes back safely to your mom. Our thoughts and prayers are with you. This is horrible! We pray and pray for Bear to come home to your mom! Is there a way she can do an search ad on the internet? We don't know what 6/21 is, but it sounds horrible. Bear, don't worry, your mom will do anything to get you home safe from harm. We're pretty spreechless but our purrs work! 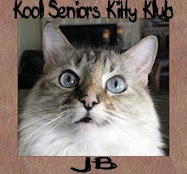 Oh JB and Mom, we will all send our most rumbly purrs to you all. We hope Bear can come home to safety soonest and this awful time ends for you all too. We hope that Bear is able to be reunited with your mom soon. It makes us sad to think that Bear is not with his proper family. We are going to pray as hard as we possibly can for Bear's safe return to your mom! We can't believe your ex-step daddy would be so cruel! Mama is so sad and mad to read this. Kaci and I just lit some candles that Bear is returned safely to your Mom. We're purring and purraying for Bear's safe return. Using an animal as a pawn is pretty low. It sounds like he needs therapy and if that doesn't work, he needs a can of pissed off kitty claws opened and applied to his face. Oops, sorry, I didn't mean to say that out loud. We are purring for Bear! JB, we are sending our strongest purrs and purrayers for Bear, and we hope that he will soon be home safe and sound with you, your Mom and Chester. Our Momma used some of the words on the bad word list about that ....... oops, we almost used some too. He is just twisted and as Parker said, sounds like he needs therapy. We love you, and you will be constantly in our thoughts. We´re so sorry to read this. We´re praying for the safe return of Bear. Keeping my paws crossed. We're sorry to hear this disturbing news. We wish for Bear's safe return. We will be praying for Bear. Hope that everything goes well for him. Do keep us posted. We will be purring and purring for Bears safe return. If your mom has legal custody of Bear and has the papers to prove it all she has to do is go to the police and ask that they go with her to get him. If Bear is purebred, and it appears that he is, if your momma's name is on his registration, that is additional proof that Bear belongs to her. I'd go to the police and file a report. I would overturn every rock in town to get that dog back. I came over from the creek cats. I am adding my purrs to everyone else and so hope you get bear back..
We's all purring an sending you purrayers fur Bear's safe return. Iffen we can do anyfing to help out, just let us know. Purrrrrrs and grrrrrrrrs for Bear's safe return!! Keep us informed!! This sounds so very scary, we're doing our bestest purring for Bear's safe return! Just a note to let you know that we hope Bear is soon back home where he belongs and the ex-daddy eats a worm! Leah really, really wants Bear to come live with us. Can we organize a DWB relay to get him to New York??? We'll be purring for Bear's safe return! Until Bear is safely returned to your mommy and your loving home, we are only going to think positive thoughts. We will pray to St. Francis to watch over him and to St. Anthoney (Patron Saint of Lost Things - we think this count) to bring him home right away. After he is home we will let Bendrix say what he is thinking. Until then, we are sending purrs and prayers to Bear, you kitties and comforting thoughts to your mommy. We are sending positive vibes and prayers for Bears safe return to you. We are purring hard for Bear's safe return. Oh JB's Mom. Mommy & are are so so sorry this had to happen. WE pray that Bear makes it him ok. Why do some people have to be so hateful and get innocents involved. We pray for his safe return. We are so sorry to hear this. We are purring and purraying our hardest that Bear returns home to you guys ASAP. If there's anything else we can do, please let us know. Hugs and purrs to all of you. I hope he is returned to you very soon and safely!! Wishing that Bear is safe and he will return to you very soon! We are praying for Bear's safe return. Take care! We are so, so sorry about this terrible situation. You all have our love and support, and our prayers that Bear is safe and is returned to you very soon. Stay strong. I'm crossing my paws and we are praying for Bear. JB we all have goose bumps and tears in our eyes! we are so very worried about everything! please please let us know more when you know more, and we are so frightened for bear. We love you all, and will pray pray pray as hard as we can. We will Pray for Ben's safe return. And whatever he's had to go through that he comes out ok. I'd send you a private e-mail but don't know your address. I might have an idea of what you could do. Send to puffie@meowmail.com and I'll let you know my suggestion. Oh noes! We are very scared for Bear and hope he will be returned to your Mom right away. Humans can be very unkind sometimes, even vengeful. We hope your ex-stepdad comes to his senses soon. We just heard about this over at Jan's place and we wanted to stop by and leave our prayer flag on the mountain. We sincerely hope that Bear will be returned to you safe and sound and healthy. You are in our thoughts and prayers and we are crossing all paws and fingers that everything turns out okay. O my friend Khyra told me about your crisis, and I am so very sorry... I cannot even imagine your fears and worries. Please know that I'm prayin for the Bear... and for the you, that you will be reunited really, really, REALLY soon! I am in Houston and if there is anything I can do, I hope you will let me and my the Mom know. oh how very sad and angry this makes us. I soo hope Bear gets to come back and live with you and is ok. I thinks about him lots and me and Mum understand how sad you must all be. I'm so sorry :( Many purrs for Bear to be reunited with your Mommy and all of you! We are still purring as hard as we can. This is very disturbing news. I am praying very hard for Bear to be safely returned to you very soon. We can even bear to imagine what ur ex step-daddy has done to poor Bear n it breaks our hearts just reading your post. We pray that he'd be returned to ur mom safely, healthly n quickly..
Ohhh ... our Chief says she totally empthathize with your mom. We do hope she finds Bear soon! We do pray for quick and safe return! Oh JB, this is horrible! We'll be praying as hard as we can for Bear's return to your Mama. She must be so heartbroken right now. We pray Bear stays safe too. Thinking of you. SORRY FOR BEING UPSET.. IF BELL WERE THERE I'D LET HER PEE ON HIM.. I can't imagine the pain and worry you must be going through now. We'll pray as hard as we can for Bear's safe return to you. We are still purring and purring for sweet Bear! We're thinking of you and continuing to send good thoughts your way. Oh this is just so heart breaking! How could anyone cause harm to a beautiful baby? What is going on? I don't know what to say... I am so, so sorry Mommy Deb! I am praying and crying for Bear. I will start the candles for him. To the little man who did this: you reap what you sow! Grow up! Don't use a helpless pet to get back at a person. I can't believe you are allowed to fly a plane full of human beings when clearly you are a monster! Sorry Deb, but, I am so angry! We have just returned from our holiday and have come straight over. We are very distressed to read about Bear, how anyone can be so vile towards dear Bear we just cannot comprehend. We will pray for his safe return to you and your family. we are sending our deepest prayers that you are reunited with Bear asap. how can anyone be mean to any animal is just beyond us. Oh no. Our hearts are breaking for you. We are purring and purring for precious Bear. Love and kittyhugs and purrs from the Ballicai. We are just catching up now and am SHOCKED to read this. Why anyone would deliberately hurt or deny happiness to an innocent animal is beyond us. I just came across your blog for the first time today. I read what happened to Bear. We will keep you in our puppy prayers until you see Bear again! We stopped in to see how y'all are doing after a long break from blogging and our hearts are broken. Our eyes are watering too. Bear, we are praying so hard for you! We love you and your family and hope you get to come home soon. JB here, AKA JellyBean! This is a photoblog of my life in my Small World with my little brother, Chester (FKA Dumplin'), my sister CocoBean, and my brother Armani. Then came along Gaia and Charli, formerly Fosters! 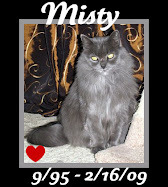 My sisters went to the Rainbow Bridge, PooPoo on 1/13/09, Misty on 2/16/09, and my big sister, Taffy on 7/29/06. I joined them on 4/26/18 and mom has been super sad ever since I left. I am now passing the CFO pawsition over to my brother, Chester, and hope he will stay focused and be a good blogger as we try to resurrect my blog. Mom will never forget me, ever. A cat is never just a cat. Wordless Wednesday - Which Photo is Out of Place? The Bag Says JB On It, and Happy Birthday, Mom!! Special Agent, JB, Is On The Case! Copyright 2019, by JB (a.k.a. JellyBean). Simple theme. Theme images by luoman. Powered by Blogger.